Just after midnight on Dec. 6, 2013, Matt Dies was asleep at home in the Riverside County town of Corona when the phone rang. His eldest son, Matthew, was calling with the shocking news that Mr. Dies’ only daughter, Mallory, 27, had been struck by a hit-and-run driver who was suspected of being drunk. Worse, doctors at Santa Barbara Cottage Hospital reported severe trauma to her head. 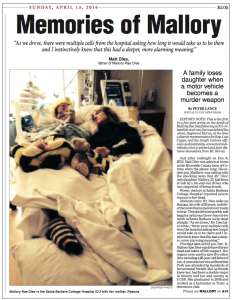 Five days later, at 3:15 p.m. Dec. 11, Mallory Rae Dies was declared brain dead and taken off life support. Her organs were used to save five other lives including a 28-year-old father of two. A memorial service at Shoreline Park was attended by hundreds of her personal friends. Mal, as friends knew her, had been a double major in history and law and society at UCSB. She graduated in 2008 and worked as a bartender at Tonic, a downtown club. 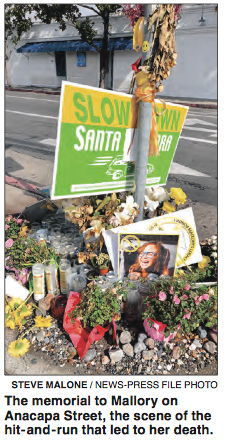 The memorial at Anacapa and Haley streets, close to where Mallory was struck down, is continually replenished with flowers and candles four months after the crash and Vow4Mal.org, a foundation set up to stop those who drink and drive, has already raised $100,000 in her name. The “Mallory Rae” support page on Facebook had more than 8,100 “likes,” prompting Facebook founder, Mark Zuckerberg, to send the foundation a box of yellow T-shirts. Mallory’s favorite color was yellow. No DUI traffic death in recent memory has polarized the city of Santa Barbara more than the crash outside EOS Lounge in the 500 block of Anacapa Street, where Raymond Victor Morua III struck Mallory Dies at a speed witnesses estimated at 40 mph. After reportedly pausing to eye the body, Mr. Morua fled the scene, only to crash his 2007 Dodge Caliber into a palm tree on Cabrillo Boulevard near State Street, about a half-mile away. This following a high-speed pursuit in which he was dogged by a young motorist who witnessed the hit-and-run and risked his own life to bring Mr. Morua to the ground. 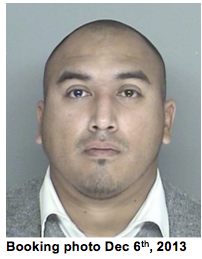 Mr. Morua, then a district representative for U.S. Rep. Lois Capps, D-Santa Barbara, was arrested and allegedly found to have a blood alcohol level of .17, more than twice the legal limit. He’s been in custody ever since. The Santa Barbara County District Attorney’s Office filed charges of murder, gross vehicular manslaughter while intoxicated and leaving the scene of an accident causing death. Mr. Morua pleaded not guilty during a court appearance in March and a guilty plea may be in the works. Before the collision, he attended The Santa Barbara Independent’s annual Holiday Bash at The Savoy nightclub. Immediately after Mallory’s death, Mrs. Capps’ office took the position that Mr. Morua attended the party on “his own volition.” Her office also claimed Mr. Morua was fired on Dec. 8, two days after the hit-and-run. But a four-month investigation has uncovered proof that Raymond Morua was not only working for the congresswoman throughout the Independent’s party, he continued to press the flesh on her behalf until he left The Savoy at 11:03 p.m. He then went to a cigar lounge next door where he met with a veteran whose case he was helping to resolve for Mrs. Capps’ office — evidence that he continued on the job through 11:14 p.m., at which time he exchanged a series of texts with his supervisor, Mollie Culver, Mrs. Capps’ district director. That text exchange ended at 11:19 p.m. when Mr. Morua paid his bill at the cigar lounge. That was just 45 minutes before the DUI collision that would ultimately claim Mallory’s life. Then, as late as Dec. 9, 2013, three days after Mr. Morua was arrested, Ms. Culver went so far as to write Mr. Morua’s signature three times on official documents from the U.S. Department of Veterans Affairs in a scheme to get him out of jail and into a Los Angeles treatment facility. The proof that Mr. Morua was “on the job” through Dec. 5, up until minutes before the fatal collision, is critical to any hope that Mr. Dies and his wife have of collecting damages from the federal government. And while the congresswoman has steadfastly denied it since Dec. 11, the evidence unearthed for this series proves definitively that while first embracing Mr. Morua as their employee and going to extraordinary lengths to get him out of jail and out of town, Mrs. Capps’ office did a 180-degree turn after Mallory Dies was taken off life support, lied publicly about the date of Mr. Morua’s dismissal, and adopted the position that neither Lois Capps nor the federal government were liable for Mallory’s death. Perhaps more alarming, the lawyer for the House of Representatives who is representing Mrs. Capps petitioned Santa Barbara County District Attorney Joyce Dudley to “segregate” evidence on Mr. Morua’s office cellphone (seized after his arrest) in what Robert Stoll, the Dies’ attorney, characterized as an attempt to “sanitize” evidence. 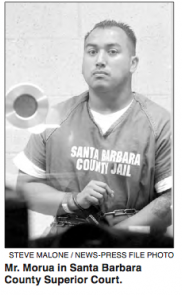 However, six days earlier, in an interview with Jaycee Hunter, the lead Santa Barbara Police Department detective investigating the case, Ms. Culver claimed that Mr. Morua was not representing Mrs. Capps at the Independent party. In fact, she went so far as to suggest that he’d misappropriated an invitation to the event from a “stack” of invites in Mrs. Capps’ East Carrillo Street office. What follows is a detailed account of Raymond Morua’s actions in the months, weeks, days and minutes leading up to that fateful collision on Anacapa Street. Raymond Victor Morua III was born in Santa Paula on March 5, 1981. 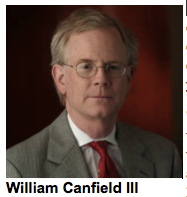 In grammar school, he was an all star in the AYSO soccer league. From the age of 8, he lived with his father in Socorro, N.M., returning to Ventura in 1999. Mr. Morua reportedly got his high school GED through the Ventura Adult and Continuing Education Program, then enlisted in the U.S. Army at the age of 20 on June 28, 2001, two months before the 9/11 attacks. After basic training he was assigned to the 1st Battalion, 35th Armor Regiment in Germany, where he worked principally as a heavy vehicle operator. As a specialist he was part of the Operation Iraqi Freedom as U.S. forces rolled into Baghdad in March 2003. He drove an M978 fuel tanker more than 75,000 accident-free miles through Germany, Macedonia, Kosovo, Kuwait and Iraq, earned five medals of commendation and achievement and was honorably discharged as an E4 Specialist on Sept. 19, 2004. Back at home Mr. Morua began an upward trajectory. He enrolled in Ventura College where he was named Distinguished Student for the 2008-2009 Academic Year. He won certificates of excellence in economics and business in 2009 and 2010, and as a student leader helped raise $20,000 to save a series of summer classes at the campus. Accepted to UCSB, he was elected president of the Student Veterans Organization and with a former SVO president accepted the UC President’s Award for Outstanding Student Leadership in May 2011. 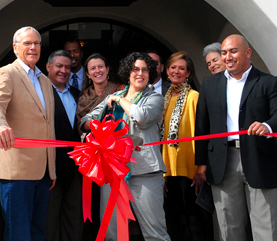 A month later, Mr. Morua went to work as an intern in Mrs. Capps’ Santa Barbara office. 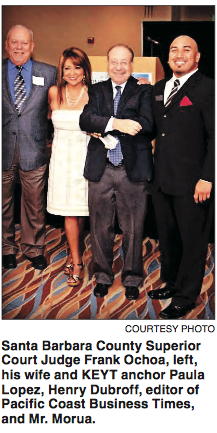 He soon became a media fixture, photographed with the congresswoman at dozens of events. In April 2012, Mr. Morua was elected board chair of the local chapter of Future Leaders of America, which provides Latino youth with leadership development skills. By that summer, he was being featured in news coverage as an Iraqi War veteran working for Mrs. Capps who was helping other vets transition to civilian life. The speech Mr. Morua gave at the Santa Barbara Elks Club, describing how he formed a nonprofit group called At Ease to help returning combat vets, included references to his turning to alcohol as a way to cope with transitioning from military to civilian life. By November 2012 Mr. Morua got the promotion he’d been waiting for, becoming one of the congresswoman’s four district representatives on the Central Coast. Mr. Morua, who seemed to lead an exemplary public life following his discharge from the Army, was so trusted by Mrs. Capps and her staff that he regularly spoke at events in her absence. An avid comic book reader since childhood, he began channeling the image of his favorite superhero, riding next to Mrs. Capps in uniform carrying a Captain America shield. 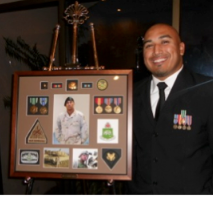 Mr. Morua represented the congresswoman at dozens of veterans and law enforcement-related events in 2012 and 2013. On Aug. 16, 2013, he appeared for Mrs. Capps along with District Attorney Joyce Dudley and state Sen. Hannah-Beth Jackson at a press conference where motorists were warned not to drink and drive during the upcoming Labor Day weekend. Three days later, Mr. Morua appeared for Mrs. Capps at a veterans memorial concert where he presented a congressional proclamation to Air Force Maj. Gen. Phillip Conley, a forward air controller during the Korean War. Sen. Jackson presented a state proclamation at the same event. On Nov. 12, 2013, Mrs. Capps delivered a U.S. flag that had flown over the Capitol to the Veterans Memorial Building in Lompoc after Mr. Morua notified her that a World War II era flag — with 48 stars — had been hanging from the balcony above the main hall for decades. 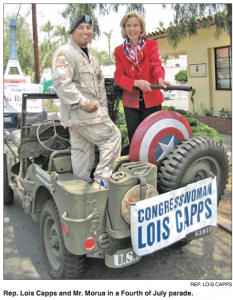 The veterans service issue was an important one for Lois Capps, a onetime nurse with master’s degrees in religion and education from Yale and UCSB, respectively, who succeeded her husband, Walter Capps, to Congress following his death in 1997 after only 10 months on Capitol Hill. Mr. Capps was a Yale Divinity School grad and doctorate who’d been an anti-war activist in the Vietnam era. But he later developed a highly regarded course at UCSB in which peace proponents and veterans engaged in a dialogue. His 1982 book “The Unfinished War” was based on that course. Mr. Morua became so identified with both the veterans issue and Mrs. Capps that his speeches became media “best bets.” So reliable was Mr. Morua as a stand-in for Mrs. Capps that he held up the ribbon as Mayor Helene Schneider dedicated the new terminal at Santa Barbara Municipal Airport in September 2013. The “Theater of War” event was sponsored in part by the Walter H. Capps Center for the Study of Ethics, Religion, and Public Life at UCSB. The university’s Interdisciplinary Humanities Center co-sponsored the event. IHC director is Susan Derwin, a Germanic, Slavic and Semitic studies professor who ran a writing workshop for veterans in which Mr. Morua participated. Ms. Derwin is an important witness in this story because on Dec. 5, 2013, she was Mr. Morua’s “plus one” at the Independent’s Christmas party — one brick in the wall of evidence that he was working on Capps-related issues at the Holiday Bash. But after the collision, at 12:04 a.m. Dec. 6, a darker side of Mr. Morua emerged. He’d been arrested on DUI allegations in Ventura in July and October 2006. For the first offense, he was found guilty by the court and ordered to pay fines and fees totaling $2,765. After the second DUI, Mr. Morua was ordered to pay $5,063 and elected to serve 18 days in jail in lieu of the fine. In December 2006, he served a two-day sentence for the July DUI and 10 days in 2007 after his conviction for the hit-and-run. He served additional time that summer to pay off court fees and was released on five years probation. Then, after keeping his nose clean for four years, he was arrested on suspicion of grand theft embezzlement after a video game coupon incident while working at Kmart in Goleta — a conviction that resulted in a 10-day stretch in County Jail in September 2011. 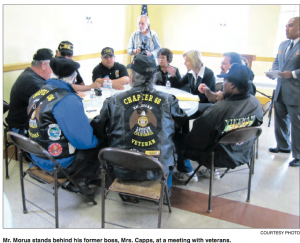 On the afternoon of Dec. 11, 2013, almost immediately after Mallory Dies was taken off life support, Mrs. Capps’ office made a concerted effort to distance the congresswoman from the war veteran with whom she’d appeared in public so often. That last line takes on huge significance considering the position that Mrs. Capps adopted about Mr. Morua, once Mr. Stoll announced plans to file a claim under the Federal Tort Claims Act with House Speaker John Boehner. “It will be alleged that he was in the course and scope of his employment at the time and place of the accident,” said Mr. Stoll, whose firm Stoll, Nussbaum & Polakov specializes in personal injury and wrongful death actions.